Please enter a valid email. Subscription is successful. Affordable, with a varied colour palette. 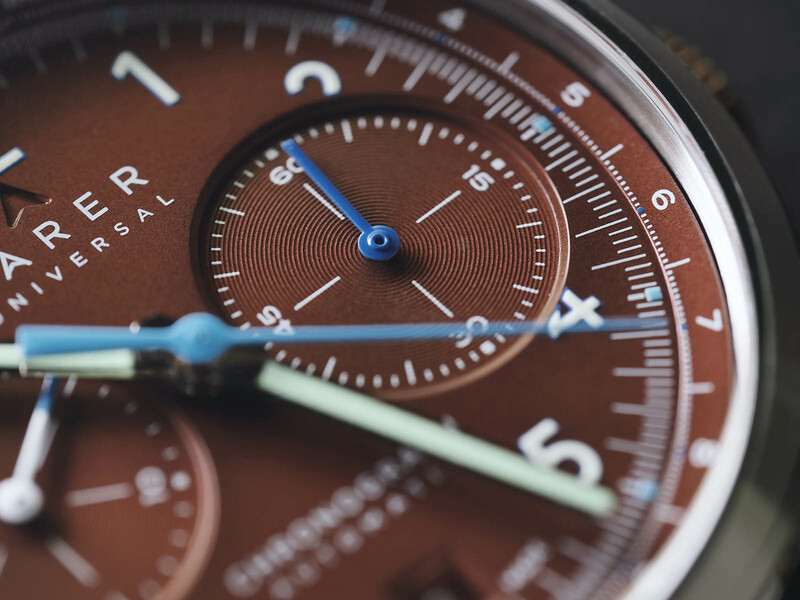 Accessibly priced, retro-style watches in smart colours are a recurrent theme for the Anglo-Swiss brand Farer, which is based in the UK but relies on a Swiss specialist for manufacturing. 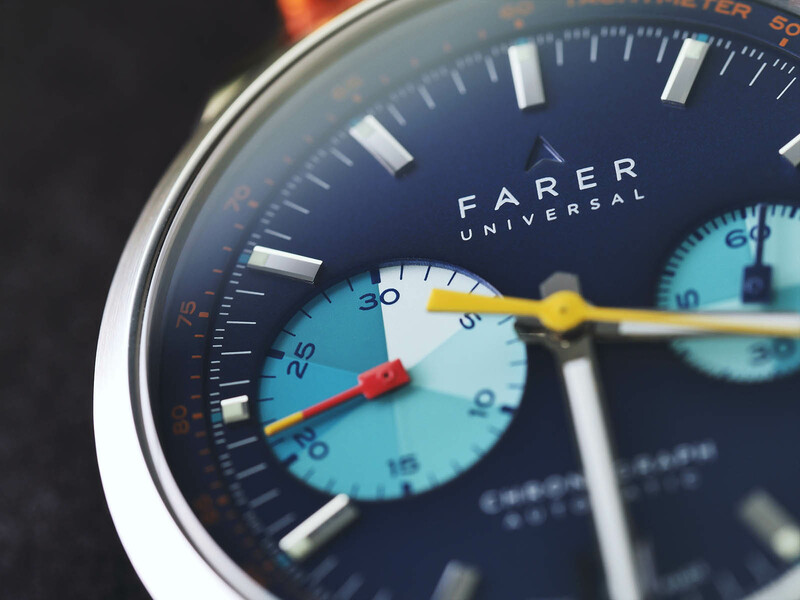 After the launch of a GMT automatic and “Super Compressor” style dive watch, Farer now debuts its first chronograph. 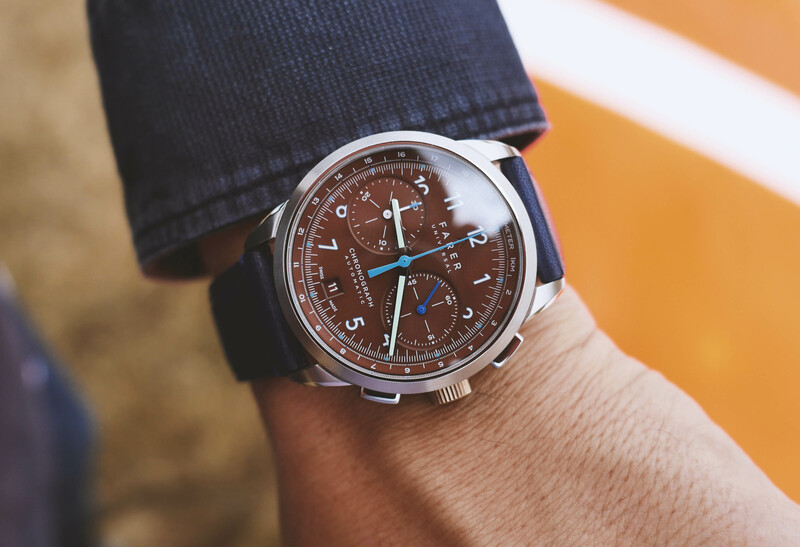 Like the brand’s preceding models, the chronograph is available in three iterations, the Cobb, Eldridge and Seagrave, all named after figures in 19th century British motor racing. The case is stainless steel, measuring 39mm in diameter and 12.5mm in height. It’s smaller and slimmer than most chronographs in its price range, largely due to the modular ETA movement inside. It’s the Elaboré-grade ETA 2894-2 (the grade means the movement is decorated with blued screws and perlage, and regulated), which is an ETA 2892 base with a Dubois-Depraz module added on top. While not integrated like the more common ETA 7750, the 2894 is significantly thinner, measuring 6.1mm high, compared to 7.9mm for the 7750. 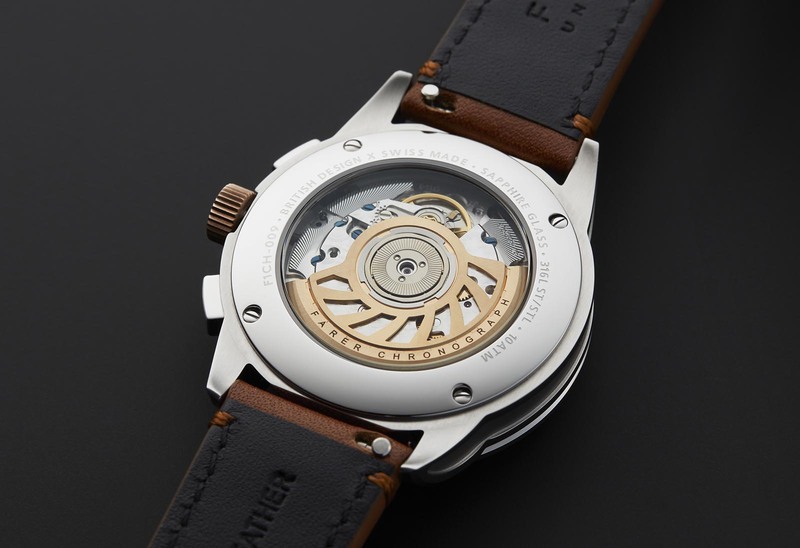 Depth-rated to 100m, the case is fitted with a bronze crown – a signature feature of Farer watches – that will acquire a patina over time. The bezel is brushed while the case feature a sandblasted recess along both flanks. Though they are variations of the same model, admirable effort has been put into making each iteration different. 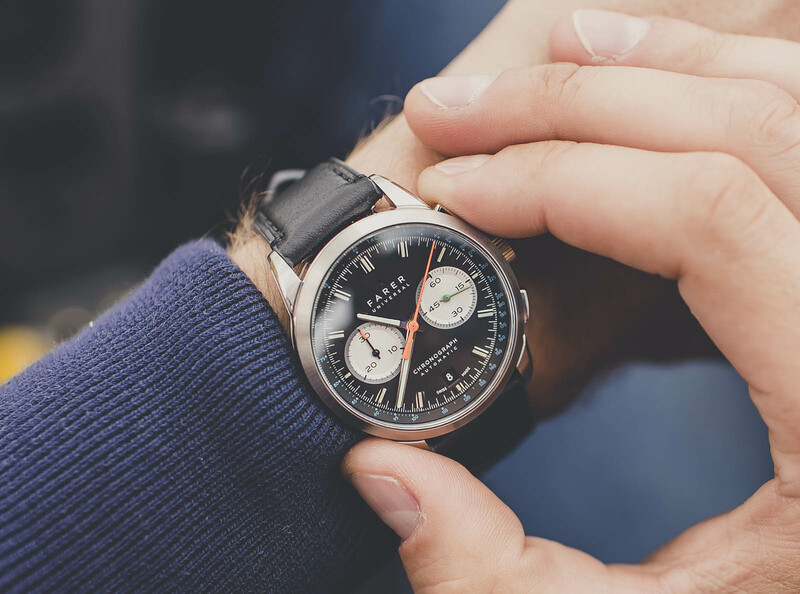 All three watches have widely different dials, distinguished not just by colour, but also in the type of hour markers, and even the size and style of the chronograph registers. But all three share the common quality of having a matching date wheel at six o’clock. 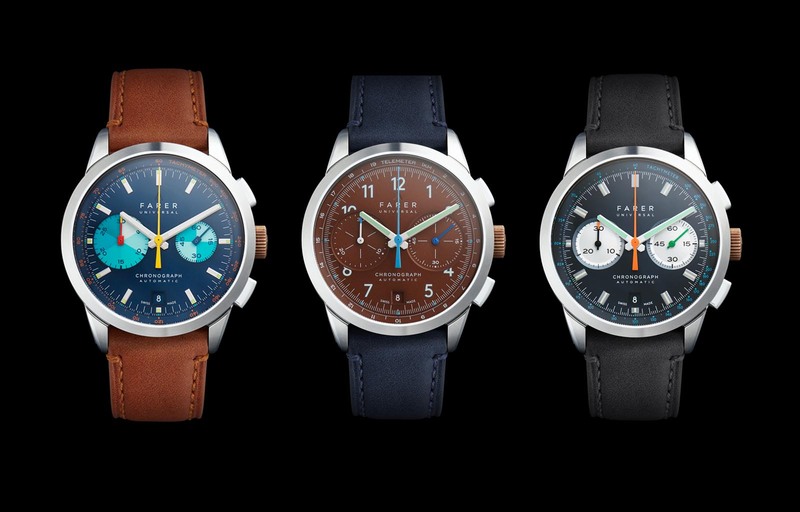 The Cobb is the most unusual and distinctive of the lot, featuring a matte, dark blue dial with a “big eye” sub-dial at nine o’clock and applied baton markers. 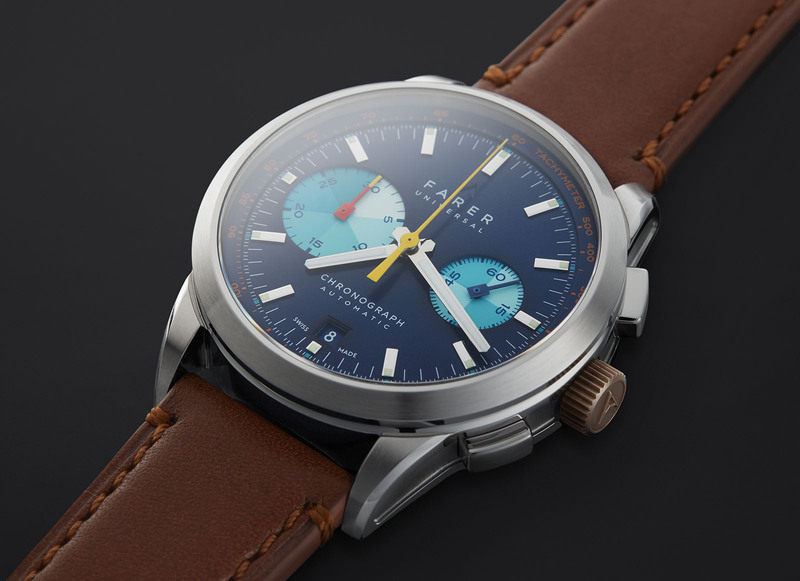 It has four distinct dial levels to display information, with a raised tachymeter and sharply sunken registers. 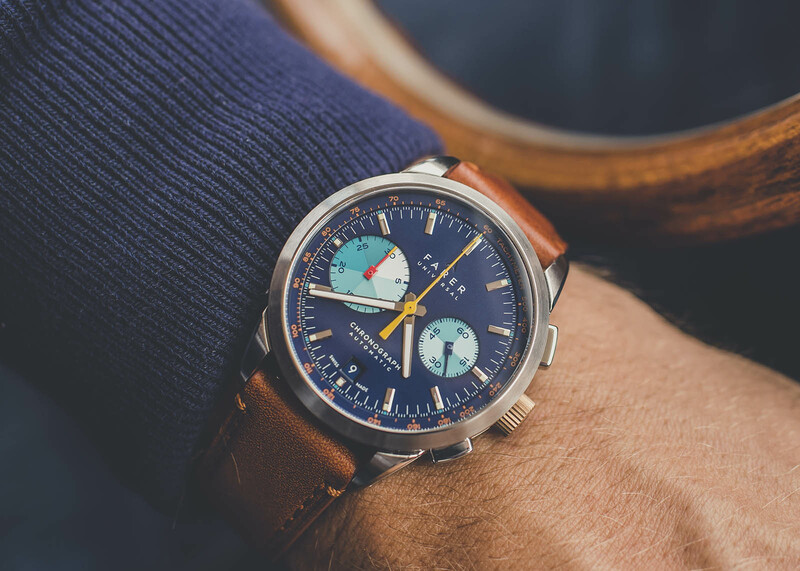 The orange tachymetric scale, as well as the yellow and orange chronograph hands give the dial colour, complementing the sub-dials that are segmented into different shades of turquoise, giving it a look reminiscent of a vintage Heuer Skipper. The most restrained of the trio is the Seagrave, a modern take on the classic “reverse panda” dial. 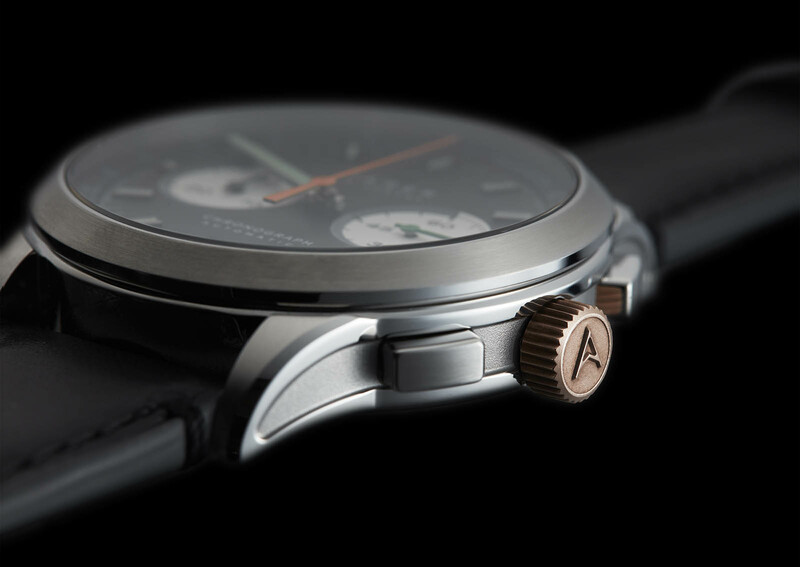 Here the white sub-dials are outlined by a graduated grey scale, matched with orange hands for the chronograph and a green constant seconds hand. Like the Cobb, the Seagrave has applied indices filled with lume, and the dial is framed by an tachymeter scale with blue markings. Of late, no vintage-inflected watch line is complete without the evocative exercise of reproducing a faux “tropical” dial. The Eldridge has a striking, metallic tobacco dial that varies in hue under the light, matched with blue accents. Featuring a telemeter scale on its raised chapter ring, the dial has a pair of equally oversized sub-dials that have a snailed finish. And unlike the other two models in the range, the Eldridge has Super-Luminova Arabic numerals for the hours. 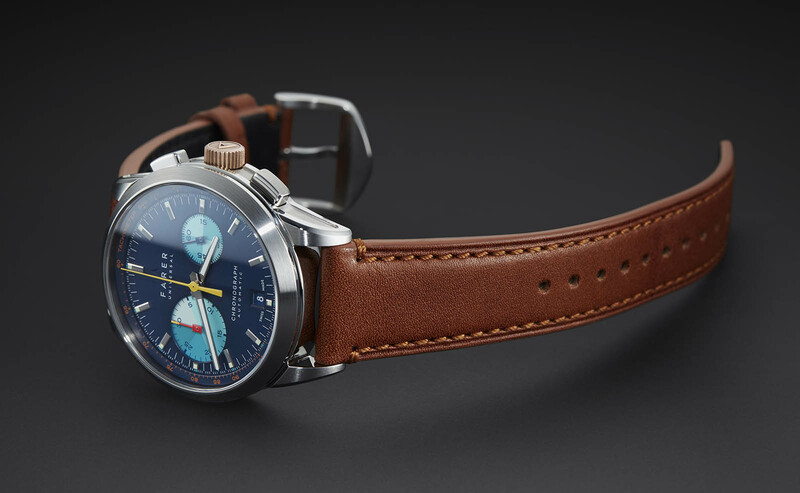 The three models are fitted with quick-release Horween leather straps. 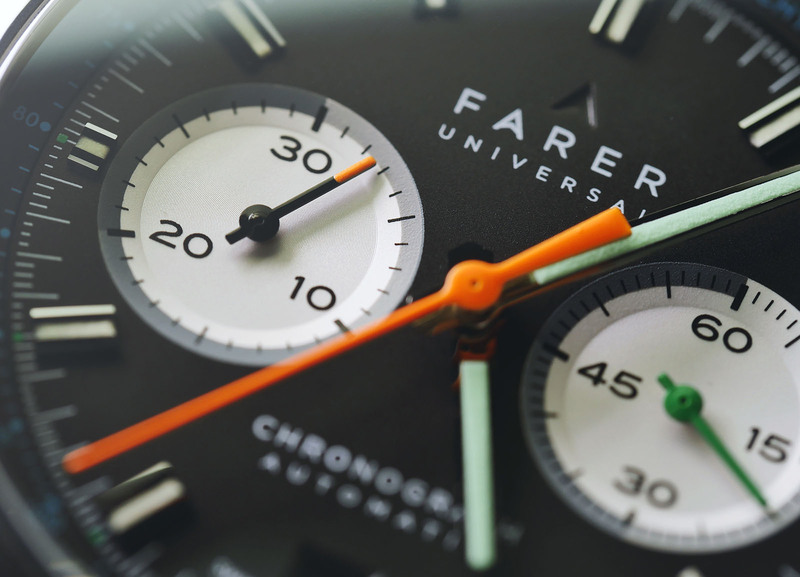 The Farer Automatic Chronograph is limited to 100 pieces in each style, and priced at €1850 or US$1950, available direct from Farer. You may also enjoy these. 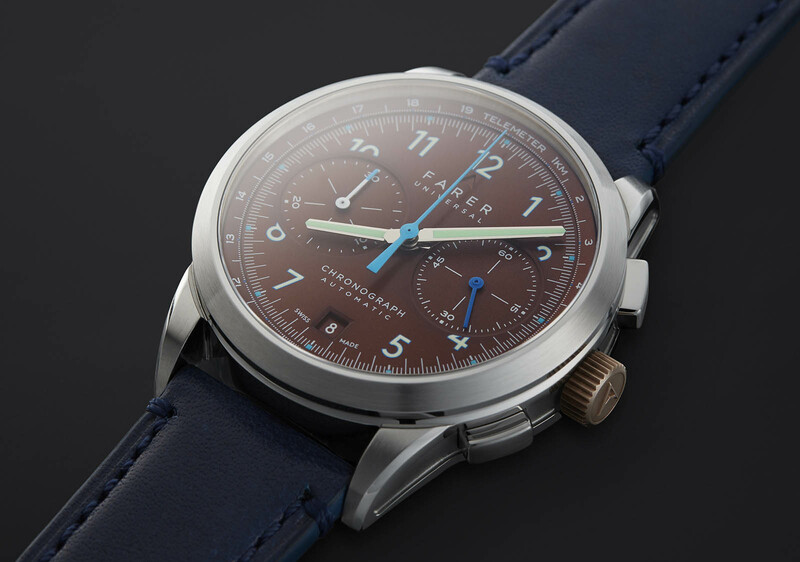 A classic, mid-20th century military pilot's stopwatch remade for a modest price. Retro design combined with a contemporary palette. Big, bold and black, the new Chronomat 44 Blacksteel is the latest DLC-coated chronograph from Breitling, powered by its in-house Calibre 01 movement. Here's all you need to know, including pricing. Welcome to the new Watches By SJX. Subscribe to get the latest articles and reviews delivered to your inbox.